Like most major cities in the U.S., Portland often suffers from less than perfect visibility due to urban air pollution, not to mention the prevalence of rain, mists, fogs and the like in its damp Pacific Northwest climate. But the views get spectacular when the cold east winds blow down the Columbia River Gorge in the winter, bringing clear skies and low humidity! 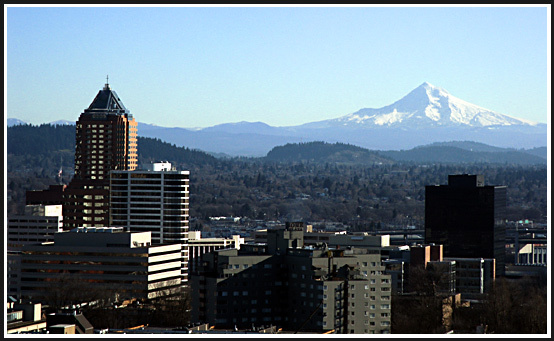 Rising to the east is Oregon's highest peak, Mt. Hood. One of the most perilous climbing routes on the mountain runs on the line between light and dark in the picture. It's Yocum Ridge, first climbed in 1959 by the Northwest's most legendary climber, Fred Beckey. Sadly, he passed away in Seattle in late 2017 at age 94. Speaking of winter and cold east winds coming down the Gorge, let's travel back in time for a moment, to the very late part of the Pleistocene Age..... It's 15,000 years ago, less than a thousand years before the first humans reached Oregon. * (see footnotes)... It's been very cold for thousands of years, and now the Great Ice Age of the Pleistocene is beginning to loose its grip just a bit.... For several thousand years, the Portland area has been repeatedly decimated by cataclysmic floods that crash down the Columbia Gorge. These are the Missoula Floods, which were formerly called the Spokane Floods, and geologists estimate there were about 100 of them. Best estimates are that the last significant Ice Age floods were about 13,000 years ago. In the image to the left, I have simulated an approaching medium size Missoula Flood. It's about five minutes away, churning across the flatlands of East Portland in a tsunami of unbelievable power, dirty, brown, like a liquid cement, full of sand, gravel, boulders, huge icebergs, tree trunks all moving at highway speeds of about 50 mph (roughly 5 times the speed of everyday flood waters, such as one might encounter when Johnson Creek floods). YOU ARE ABOUT TO BE WIPED OUT WHERE YOU STAND TAKING THIS PICTURE! THE SOLES OF YOUR FEET FEEL A DEEP RUMBLING. YOU NEED TO RUN VERY FAST UPHILL! ...."Medium Size" in the case of a Missoula Flood might mean the wave front is "only" 250 feet high, and therefore does not completely bury Kelly Butte; in my representation, I have Kelly Butte acting as a island in a river, with the flood separating around it. 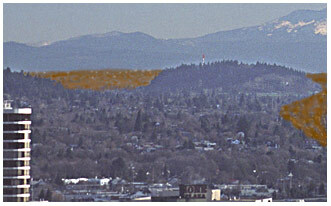 If one examines the SSE side of Kelly Butte (right above where the old drive-in movie theater was), one sees that that side of the butte is very much steepened, so much so that this side of the Butte was probably exposed to the strongest part of the passing floods. * People? Experts formerly believed that there were no people around to be destroyed by these floods. However, the most recent finds of real archaeological evidence place Man in Oregon well before the ending of the Missoula floods period. Formerly, it was thought that Clovis Man was first to occupy America, but the newest finds from Paisley Caves in Eastern Oregon have been conclusively dated to 14,300 years ago, and the DNA evidence points to people of Siberian or East Asian descent (Dr. Dennis Jenkins from the University of Oregon has been in the forefront of this research). Nearby to Paisley Caves is famed Fort Rock Cave, where UO Anthropology Professor Dr. Luther Cressman discovered the renowned Fort Rock Sandals in the 1930s, later dated to 9,000 years ago. Just across the border in Washington, the famed find of the complete skeleton of "Kennewick Man" is accurately dated at 9,400 years old. Although the Bering Ice Bridge (Beringia) existed for thousands of years and was up to 1,000 miles broad, its greatest extent was during the most extreme part of the Ice Age when the great Canadian Ice Sheet had invaded Puget Sound and filled it all the way south past Olympia, and out to sea. Probably any would-be settlers could not negotiate the route south until a critical time period when the Ice Sheet had shrunk enough to free up a land route south, but before sea levels had had a chance to rise enough to erase the Land Bridge (the Bridge went back under water about 10,000 years ago). Were there Animals around to be destroyed? Yes, uncounted multitudes were destroyed each time one of these floods would smash into Oregon. Let's move now to another page, where we will visit a refuge about one mile uphill from the place where the images on this page were taken: See: Refuge from the Floods! Council Crest Miracle Acoustics and St. Helens Views! * Footnote: scientists are NOT in agreement about how and when early man took up residence in the Americas. Some lines of evidence point to multiple migrations during the Ice Age times, some even pushing times back to 30,000 years ago, with such estimates based on mitochondrial DNA studies. Some even posit that early settlers may have bypassed the Ice Age glaciers and the Bering land bridge entirely by simply sailing across the Pacific Ocean, like the Polynesians did.... Unearthed in 1932, the famed Clovis point from New Mexico could perhaps be called the starting point of the science, and was dated at 11,500 years ago.